This is the first issue of the new journal Intersections. East European Journal of Society and Politics (EEJSP). As our point of departure, we take a timely subject for European societies: the far-right phenomenon as related to mainstream politics and discourse. 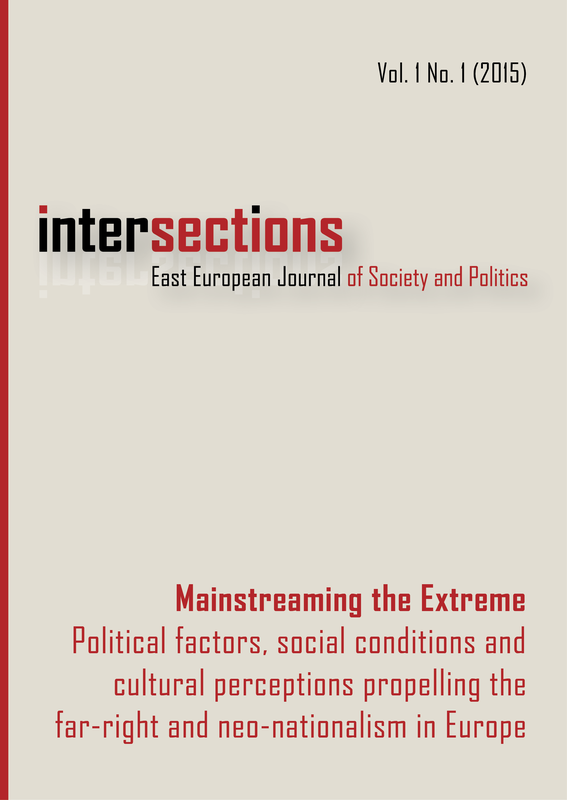 Instead of relying exclusively on views of radical developments prevalent in the field of politics, our aim was to bring together insights from sociology, social anthropology, political science and media studies, as well as from discourse and network analysis, and integrate them into a comparative and interdisciplinary study of the phenomenon. As far as the investigated topics are concerned, special attention has been paid to the interplay of media and politics, the discursive aspects of politics, and the role of cultural commodification beyond ideologies on the supply side as well as recent developments explaining increasing interest on the demand side. Barker, M. (1981) The New Racism. Conservatives and the Ideology of the Tribe. London: Junction Books. Bíró-Nagy, A. and D. Róna (2013) Rational Radicalism: Jobbik's Road to the Hungarian Parliament. In Mesežnikov G, O. Gyárfášová and Z. Bútorová (eds.) Alternative Politics? : The Rise of New Political Parties in Central Europe. Bratislava: Institute for Public Affairs 149-183. Bjørgo, T. (1997) Racist and Right-wing Violence in Scandinavia. Patterns, Perpetrators and Responses. Oslo: Tano Aschehoug. Boda, Zs., G. Szabó, A. Bartha, G. Medve-Bálint and Zs. Vidra (2015) Politically Driven: Mapping Political and Media Discourses of Penal Populism—The Hungarian Case. East European Politics and Societies. OnlineFirst published on December 4, 2014 as doi:10.1177/0888325414557026, 1-21. Coll, S. (2004) Ghost Wars: The Secret History of the CIA, Afghanistan, and Bin Laden, from the Soviet Invasion to September 10, 2001. New York: Penguin Books. Ellinas, A. A. (2009) Chaotic but Popular? Extreme-Right Organisation and Performance in the Age of Media Communication. Journal of Contemporary European Studies, 17 (2): 209-221. Feischmidt, M. (2014a) Neonationalism and Far-right Support amongst Hungarian Youth. Paper presented at the Association for the Study of Nationalities (ASN) ‘Nationalist Responses to Economic and Political Crises’ Conference, 12-14 June 2014. Central European University, Budapest. Feischmidt, M. (2014b) Populáris emlékezetpolitikák és az újnacionalizmus: a Trianon-kultusz társadalmi alapjai (Popular Policies of Memories and Neo-nationalism: Societal Foundations of the Trianon Cult). In Feischmidt, M. et al. Nemzet a mindennapokban: Az újnacionalizmus populáris kultúrája (Nation in Everyday Life: Popular Culture of Neo-nationalism). Budapest: L’ Harmattan. 51-81. Feischmidt, M., R. Glózer, Z. Ilyés, V.K. Kasznár and I. Zakariás (2014) Nemzet a mindennapokban: Az újnacionalizmus populáris kultúrája (Nation in Everyday Life: Popular Culture of Neo-nationalism). Budapest: L’ Harmattan. Feischmidt, M., K. Szombati and P. Szuhay (2013) Collective Criminalization of Roma in Central and Eastern Europe: Social Causes, Circumstances, Consequences. In S. Body-Gendrot, M. Hough, K. Kerezsi, R. Lévy and S. Snacken (eds.) The Routledge Handbook of European Criminology. London: Routledge. Glózer, R. (2014) A nemzet helyreállítása a magyarországi nemzeti radikális mozgalom ellenségtematizáló diskurzusaiban (Restoringthe Nation in Discourses of National Radical Movements Thematizing Enemies). In: Feischmidt, M. et al. .Nemzet a mindennapokban: Az újnacionalizmus populáris kultúrája (Nation in Everyday Life: Popular Culture of Neo-nationalism), Budapest: L’Harmattan. 159-208. Hervik, P. (2008) Integration through Insult. In Eide, E., R. Kunelius and A. Phillips (eds.) Transnational Media Events. The Mohammed Cartoons and the Imagined Clash of Civilizations. Gothenburg: Nordicom. 213-234. Hervik, P. (2011) The Annoying Difference. The Emergence of Danish Neonationalism, Neoracism, and Populism in the Post-1989 World. New York and Oxford: Berghahn Books. Hervik, P. (2012) Ending Tolerance as a Solution to Incompatibility: The Danish ‘Crisis of Multiculturalism’. European Journal of Cultural Studies, 15 (2): 211-225. Hervik, P. (2014) Cultural War of Values: The Proliferation of Moral Identities in the Danish Public Sphere. In Tripathy, J. and S. Padmanabhan (eds.) Becoming Minority: How Discourses and Policies Produce Minorities in Europe and India, New Delhi: Sage. 154-173. Hjarvard, S. (2008) The Mediatization of Society: A Theory of the Media as Agents of Social and Cultural Change. Nordicom Review, 29 (2): 105-134. Holmes, D. R. (2009) Integral Europe: Fast-capitalism, Multiculturalism, Neofascism. Princeton, NJ: Princeton University Press. Hoskins, A. and B. O’Loughlin (2010) War and Media: The Emergence of Diffused War. Cambridge UK: Polity Press. Huntington, S. P. (1996) The Clash of Civilizations and the Remaking of World Order. New York: Simon & Schuster. Juhász, A. (2010) The appropriation of the Roma issue. MS.
Hara, K. and Zs. Vidra (2014) Introduction to the Special Issue: New Forms of Intolerance in European Political Life. Journal of Immigrant and Refugee Studies, 12 (4): 353-362. Kalb, D. and G. Halmai (2011) (eds.) Headlines of Nation, Subtexts of Class. Working Class Populism and the Return of the Repressed in Neoliberal Europe. Oxford: Berghahn Books. Krekó, P., A. Juhász and Cs. Molnár (2011) A szélsőjobboldal iránti kereslet növekedése Magyarországon (The Rise of the Social Demand for Rightwing Extremism in Hungary). Politikatudományi Szemle, 22 (2): 53–79. Lubbers, M., M. Gijsberts and P. Scheepers (2002) Extreme Right-wing Voting in Western Europe. European Journal of Political Research, 41 (3): 345-378. Mann, J. (2004) Rise of the Vulcans: The History of Bush’s War Cabinet. New York: Penguin Books. Nohrstedt, S. A. (2013) Mediatization as an Echo-Chamber for Xenophobia Discourses in the Threat Society: The Muhammad Cartoons in Denmark and Sweden. In Wodak, R., M. KhosraviNik and B. Mral (eds.). Rightwing Populism in Europe: Politics and Discourse. London: Bloomsbury Academic. 309-320. Rydgren, J. (2007) The Sociology of the Radical Right. Annual Review of Sociology 33: 241-262. Pelinka, A. (2013) Right-Wing Populism: Concept and Typology. In Wodak, R., M. KhosraviNik and B. Mral (eds.). Rightwing Populism in Europe: Politics and Discourse. London: Bloomsbury Academic. 3-22. Prins, B. and S. Saharso (2010) From Toleration to Repression: The Dutch Backlash against Multiculturalism. In Vertovec, S. and S.
Wessendorf, (eds.) The Multiculturalism Backlash. European Discourses, Policies and Practices. Oxon: Routledge. 72-91. Strömbeck, J. (2008) Four Phases of Mediatization: An Analysis of the Mediatization of Politics. International Journal of Press/Politics, 13 (3): 228-246. Swoboda, H. and J. M. Wiersma (2008) (eds.) Democracy, Populism and Minority Rights. PSE, Socialist Group in the European Parliament. Vertovec, S. and S. Wessendorf (2010) (eds.) The Multicultural Backlash: European Discourses, Policies and Practices. London: Routledge. Vidra, Zs. and J. Fox (2014) Mainstreaming of Racist Anti-Roma Discourses in the Media in Hungary. Journal of Immigrant and Refugee Studies, 12 (4): 437-455. Wodak, R. (2013) Anything Goes. The Haiderization of Europe. In Wodak, R., M. KhosraviNik and B. Mral (eds.) Rightwing Populism in Europe: Politics and Discourse. London: Bloomsbury Academic. 23-38. Wodak, R. and A. Pelinka (2002) From Waldheim to Haider – an Introduction. In Wodak, R. and A. Pelinka (eds.) The Haider Phenomenon. London: Transaction Publishers. vii-xxvii. Wodak, R., M. KhosraviNik and B. Mral (eds.) Rightwing Populism in Europe: Politics and Discourse. London: Bloomsbury Academic. xvii-xxviii. FEISCHMIDT, Margit; HERVIK, Peter. Mainstreaming the Extreme: Intersecting Challenges from the Far Right in Europe. Intersections. East European Journal of Society and Politics, [S.l. ], v. 1, n. 1, mar. 2015. ISSN 2416-089X. Available at: <https://intersections.tk.mta.hu/index.php/intersections/article/view/80>. Date accessed: 22 apr. 2019. doi: https://doi.org/10.17356/ieejsp.v1i1.80.